The New Forest belies its name in every way. Certainly not new, it has a history that stretches back over 900 years to the times of William the Conqueror when it was set apart as a royal hunting ground, much of the Forest is still owned by the Crown and the laws are still maintained in part by the institution known as the Verderers Court. The name Forest does not denote an area entirely covered with trees either, but an area of heath, bogs, woodland and upland plains. When the Forest was set apart for royal pursuits, the folk of the Forest were not allowed to fence their land to prevent hinderance to the King’s hunt. They were instead compensated with certain rights known as Rights of Common such as grazing their animals on the Forest land and using Forest wood and peat for fuel. Some of these rights are still exercised today by locals known as "Commoners", those who live in properties within the Forest that have commoning rights attached to them. Thus the Forest, protected by fences and cattle grids on the entrance roads, is home to ponies, cattle and pigs grazing freely on the plains and in the woodland glades. All these animals are owned and cared for by the commoning families and monitored by the five Agisters, employed by the Verderers, on a regular basis. The woods of today’s Forest fall into two types. Some of it is fast growing conifer and surrounded by fencing. These are the remaining "Inclosures" that were set up during between the 17th and 19th centuries as timber plantations mainly for ship-building. Inclosures are the areas of the Forest where the Commoners animals are not welcome. 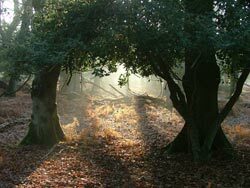 Other areas are ancient and ornamental woods where native trees such as oak, beech and holly dominate. The Forest of today is now a National Park and run in conjunction with the Forestry Commission and the Verderers Court in an effort to continue the ancient traditions in the context of the modern world. 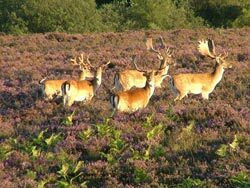 Amongst the mixture of heath, broad-leaf woodland, peat bogs, wetland areas and the managed pine woods, there is a wide diversity of fauna and flora. 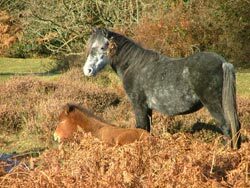 The New Forest provides its visitors a unique and stunning environment with a fascinating history dating back to the Bronze Age and including in more recent centuries activities such as smuggling and rebellion. Much of its area may be freely explored, but the visitor needs to respect the fragility of the landscape that is being so carefully preserved.